Alleva is so close and convenient, but somehow we rarely come close to setting foot inside the place. I blame this on the cheezification of Little Italy. 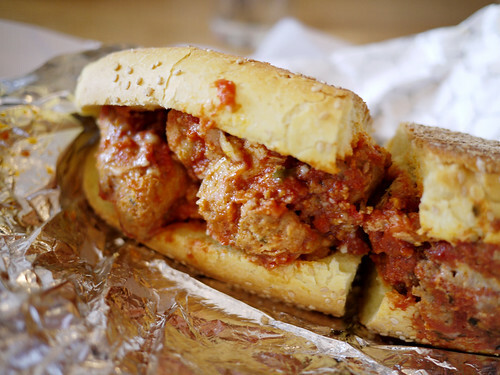 So today, I decided to overcome it and go for their meatball sub, recommended by a few of our internet friends. One problem I encountered was that they only had 1 meatball left (I don't know how many come in a hero I'm guessing 3? ), so the guy suggested chicken parm instead but I asked him for the last meatball and to fill the rest with the chicken. And boy was I glad, because the chicken parm was dry and tasted of plastic or something stale (perhaps the breadcrumbs stored too long?). But the meatball was indeed garlicky mushy and super flavorful. And funny, it turns out we tried this a few years ago and thought it was good then too. Thanks for the shoutout! It's too bad they were out of meatballs, I think they are the best I've had in NYC. PS. I think the hyperlink is dead.